EA released a short overview of Star Wars Jedi: Fallen Order during Microsoft’s Inside Xbox stream today. Aaron Contreras, the narrative lead at Respawn Entertainment, gave us an quick look at the main cast. He also mentioned how the combat will be accessible. Star Wars: Jedi Fallen Order won’t be a button masher or a hack-and-slash game. Instead, combat will be methodical as you look at enemies, see what their strengths and weaknesses are, and then strike with the right move. 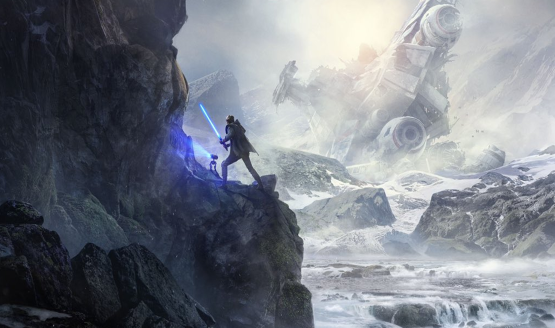 With Contreras’ explanation on what Star Wars: Jedi Fallen Order‘s combat is like, it’s hard not to draw comparisons to FromSoftware’s Dark Souls or even Sekiro: Shadows Die Twice. However, as they previously mentioned, there will be a lot of depth to the combat that will be rewarding to those who put the time in. Perhaps it could be like God of War‘s difficulty options, which have a wide range from fairly easy to incredibly difficult. Contreras also teased that we will be facing monstrous creatures across various different locales of the Star Wars universe. Could we face a rancor, perhaps? Training Kestis to fight this villainous threat is Cere, a former Jedi Knight. Contreras calls her an unconventional master, and he thinks she fills a void that we haven’t seen in other mentors from Star Wars‘ past. Contreras also brings up Cal’s best pal, the droid BD-1, and compares them to the relationship between a boy and his dog. However, BD-1 doesn’t seem to be just a normal droid. According to Contreras, “Cal’s sort of an equal partner in this story,” and this droid has his own agenda. Recent Star Wars films like Rogue One and Solo: A Star Wars Story have shown that droids can become less subservient to their masters. Perhaps Star Wars: Jedi Fallen Order will continue that trend with BD-1. Star Wars: Jedi Fallen Order releases on November 15, 2019, and it’s now available to preorder on Amazon. Do you think the force is strong with this game or will it have a low midichlorian count? Let us know in the comments below!